Chocolat: macaron biscuit with creamy chocolate filling. Vanilla: macaron biscuit with creamy vanilla filling. Red velvet: macaron biscuit with cream cheese filling. Raspberry: macaron biscuit with creamy raspberry filling. Mocha: macaron biscuit with creamy mocha filling. Lemon: macaron biscuit with creamy lemon filling. Matcha: macaron biscuit with creamy green tea filling. 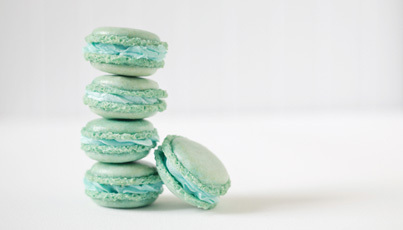 Mint: macaron biscuit with creamy mint filling. Coconut: macaron biscuit with creamy coconut filling. Our macarons are made without the top 10 food allergens, are gluten free and completely vegan. They are soft and moist on the inside, and lightly crunchy on the outside with a delicious creamy filling, in a variety of flavors. A delightful treat for the whole family!